It’s no secret; we take this event very seriously. My coaching instinct is to prepare my teams mentally and physically for this challenge and we use every (legal) trick in the book. To that end, I’m glad they’ve taken caffeine off the WADF banned substances list? Nuff said. We failed to meet up the week before the event like we did last year, and this worried me. All it takes is for one rider not to take it ‘that’ seriously and the whole team’s wheels could come off spectacularly. All communication had to be made via e-mail instead. Our team’s moto was ‘No Regrets’. This meant that the riders had to prepare their brains and bikes and anticipate all the potential pitfalls, both mechanically and mentally – all this way before the event actually started. I had two sets of wheels, one for the mud and one for the dry. I had latex running in both wheelsets to seal any punctures as they happened enroute. You get the idea. Mental preparation was not complicated. It was just a case of getting the riders to anticipate what they were going to experience and be prepared for it. Forewarned is forearmed and all that. There was to be no moaning or negativity – what’s the point? There was no question that come hell or high water, we were going to finish and give this event 100%. Nutritionally, every rider, including myself (yes I did it this year), had a TORQ ribose based recovery drink after every lap. Of course we consumed TORQ bars and TORQ energy, but we ate other food too. The emphasis was on very high carbohydrate foods, rich lean sources of protein and as little fat as possible. Fat is the enemy in this kind of event. If you have a fatty meal, that’s you stuffed for 3-4 hours, during which time you can’t eat any useful calories. I’ve said it before and I’ll say it again ‘dietary fat is bad news’. Carbohydrate digests very quickly and fuels the muscles. Fat will clog-up your digestive system and offers no metabolic benefit. It’s rather like putting engine oil in your petrol tank. Everyone (even really skinny people) have plenty of ‘burnable’ fat, you don’t need it in your stomach. Oh yes, and water… lots of it. And, if you’re sleeping you’re not eating. Right, can’t give all our tips away. We had 2 teams this year, one in Sport and one in Expert/Elite. 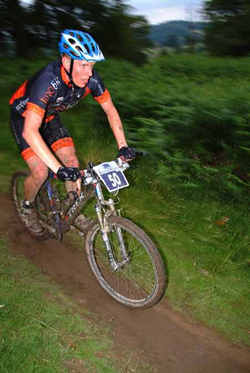 I was in the Sport team with Steve Shaw, Simon Turner and Simon Burgess. We knew we had a strong team and we thought the win was a definite possibility, but that didn’t stop us being dead chuffed with 3rd place and a spot on the podium. The others have given their account of the event below, but personally, I knew my technical and bike handling was better than it has ever been, but my fitness was just ok. Well, ok for me if you know what I mean? Being a busy man running TORQ and wanting time to cuddle my wife and daughter has taken a toll on my available cycling time, but I did plan for this. We’ve been sponsoring the Premier Series and Trek 6-4-2 and I vowed to ride the 4-hour events this year instead of sitting in Cassa TORQ selling bars all day. I have also run a couple of Fitness Weeks which has given me some form by default. My skeleton training plan was ‘enough’ I’d say, but I wouldn’t want to embarrass myself in Elite. Our Elite team, consisting of Marcos Schier, Ross Adams, Nick Collins and Will Simmons was the strongest we’ve ever had and their 4th place in the event was testament to this. You’ll note from the lap times, how consistent these guys were. 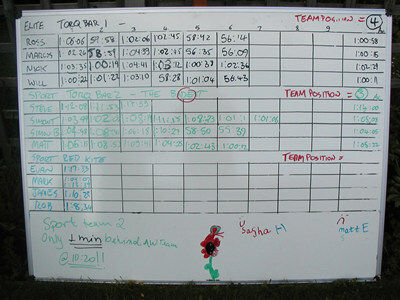 We had a white board with ongoing updates on lap times. Knowledge of results is a great motivator. I wanted everyone to work as a team, but there’s nothing wrong with a bit of a competition within the team, so some TORQ products were up for grabs for the fastest lap in each team and the quickest average lap time (Sorry Will, not given you your prize yet). 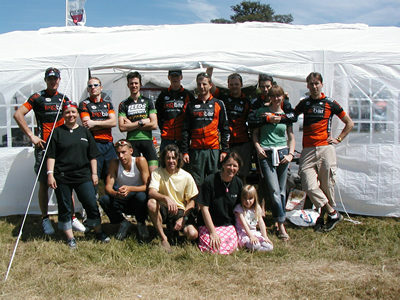 I did feel for the Elite TORQ team, because prizes only went up to 3rd place. They were of a higher standard and had trained harder for this event than us (the Sport team), yet we went away with a box full of prizes and they got nothing. What I’m about to say is in no way a criticism of the event or its organisers – it’s fabulous. However, in view of the impending 2012 Olympics I do feel that our whole nation needs to re-address its attitude to elite sport. We need to encourage the elite and reward them. We got some great prizes for coming 3rd in Sport, but we should have been looking at the elites and thinking, “Hey those guys in 8th were only 1 minute quicker than us, but look how much better their prizes were?” In my view, this encourages Sports cat riders to enter Elite next year and stops so-called ‘pot hunters’ who enter a lower category to get a prize. It also bolsters the elite field. We must encourage our elite riders and elite sport in general. I love the idea of blokes with ironing boards strapped to their backs wearing their wives knickers on their heads too (well it floats my boat anyway), so how about some random spot prizes for the ‘most bizare’. Just a couple of thoughts. We’ll be back next year regardless of course. Disasters? Yes. I realised that I couldn’t ride on 1.5 Conti mud tyres. I’m a big air chamber tubeless tire convert, because I hit things so hard. I’ve never ridden as quickly as I do now, and it’s because I don’t pinch puncture anymore. Suffice to say, I pinch punctured my 1.5’s on the first lap. Couple this with my pathetic bike handling – I just wasn’t confident looking over that thin front tire. I broke my first rule – I was not prepared. When I pinched, the latex had started to work, but my tyre was flat. For this I was prepared. I hopped off, stuck a pressurised gas canister on the valve and I was on my way again in under 30 seconds, the latex sealing the hole on re-inflation. Oh yes, and I lost power to my lights towards the end of my first night lap and used the force’ to get back. Ok, so that wasn’t disastrous, just annoying. Disaster struck Steve Shaw at about 1am when he re-broke a couple of ribs. When I saw the state he was in on returning to the camp, I looked at my fellow team members and said ‘It looks like we’re down to a 3-man team’. There was no way we could send Steve out again, if not for his own safety, but for the risk to the team if he got marooned. So we did 13 hours with 3 men. The guys think it cost us the win, but I don’t know. That’s the beauty of Mountain Mayhem. Who knows what problems the other teams had? Anyway, that’s enough from me. May I thank all the TORQ riders and equally importantly the amazing mechanical support we received from Jeff and Jay Spetch and the endless feeding from Sasha and Vere. 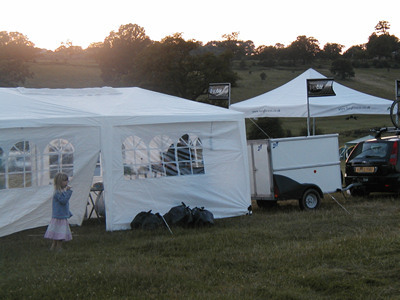 Also, a big thanks to B&Q for the 3 X 9 party tent, our home for the weekend and a great addition to the team. Oh yes, and a ‘big up’ for Jeremy Olsen and Ian Barrington who were separated by only minutes in the Solo Men’s event, finishing in 6th and 7th place respectively. Jeremy, formally TORQ-tuned is recovering from being married a year or so ago and Ian came out to the Pyrenees on the recent TORQ fitness week to peak for this event. Both did fantastically. 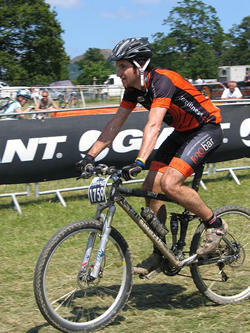 Rob Lee of TORQ-fuelled Extreme endurance was in a creditable 8th. Also, ‘big up’ to AQR’s Kate Potter for finishing in second place in the solo women’s event, despite receiving a nasty injury to her knee in the middle of the night. Kate will also be present to guide you through the Pyrenean TORQ fitness weeks if you want to come out for some inspirational riding and coaching. Ross Adams (ELITE): After losing the toss with Marcos and having to do the run, I was more than a little nervous on the start line. The run itself went better than I could have hoped for, still being able to see the leaders as we came through to get the bikes. However, the run caused me not to be able to pedal properly for the first lap, and I was very disappointed to be so far down after just one lap. Good, consistent team riding over the afternoon allowed me to catch and overtake the 4th placed team in the early hours of Sunday morning, despite me crashing whilst trying to actually get past them! With our team somehow up to 3rd on the leaderboard, we all put our race heads on, the thought of cash prizes the main factor behind my new-found enthusiasm! Although this proved just to be an error by the timers, we comfortably maintained our 4th position overall. Riding with such an organised team was very different to how I have done 24hour races in the past, but all the advice on food must have worked, as I was feeling just as good on Sunday as I was Saturday, maybe even better after I had got the run out of my legs! It was disappointing not to have finished in the top 3, but that gives us something to aim for next year I guess. Will Simmons (ELITE): Another great event and a great performance by the team. The course was improved a bit from last year, but still had too many places where the average rider had to walk causing ‘mountain mayhem’ when trying to overtake [Ed. All part of the drama mate]. However, our laps were fast and most importantly consistent, it’s just a shame there’s no cash for 4th! Simon Turner (SPORT): When I first thought about racing the SSMM again I was a little reticent after the mud bath disaster that was 2004. 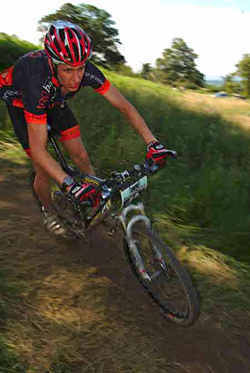 A race I also rode with a compound fracture of the finger following some inappropriate finger (steady…) disc rotor interface action two weeks before. But I thought I could use the race to collect sponsorship pledges for the MND Association. Plus I thought it can’t be as bad as last year – and amazingly it wasn’t! Although, including the race, it was a tough few days, some of you will know that on the Wednesday before the race on Saturday my race bike was stolen from our offices, Aghhh! Nightmare. Sadly it was a special bike, that my mother enabled me to purchase after she passed away and I was really looking forward to riding it at the race and using it to collect sponsorship for her disease charity Motor Neurone Disease. It was not to be. Having just finished my first Peak of the year I’d not done much endurance work since the beginning of May with the Dyfi Enduro the week after the Gorrick 94miler (sorry ‘100km’, snigger). As a result I was a little worried that I would not be able to keep the pace up for my full 5 or 6 laps. I was pretty excited when it came to it, we had a good team and a really good chance of doing well I reckoned. My excitement got a little pissed upon on Friday when the south-west had massive thunderstorms and flash flooding – oh God 2004 all over again. But not quite, as it stopped raining early on Saturday and gradually got better. It was a race of two halves really – for two reasons – Firstly it was muddy for the first half and fast and dry for the second, and secondly we lost a teammate just on half way. I liked the first half, I don’t mind the mud, it’s a good test and pretty funny slipping around at high speed downhill on Conti 1.5 mud tyres. I was pretty happy with the first two laps really putting it in and matching or beating our Elite team members lap times. The other guys put in steady times and we settled into the top ten. As night fell some weird stuff started to happen – we had the London Philomonic Orchestra playing pop songs and some pretty cool fireworks, Steve then had a really slow lap. Last year I got horrific cramps on my night lap and was seriously scared of it happening again. So I downed the tonic water, re-hydration salts and ibuprofen [Ed. None of which are on the banned list – although you’re getting pretty close with the ibuprofen – who told you take that?]. I was so happy when I got back having completed a good enough lap with no cramps! But not so happy when Matt informed me that Steve was out for the count. 12hrs with three men – bugger! Still I figured it wouldn’t be that different from Dusk till Dawn – no sleep, less time to get food in and less rest. I got sluggish over the next two laps and felt rubbish – Matt finally worked out that my water intake had not matched my glycogen intake (so my food was dehydrating me from the inside – not nice). Dawn had broken clear and bright and it was drying fast, an excellent way to cheer us up. Time to change tyres (perhaps one lap too late judging by my lap time). The course had turned from an upper body wrestling match for control of the bike, into a fast flowing blast. Better than that was the news that despite our disadvantage we had moved up to third, fantastic. But it was tight at the top. They guys in fourth caught me on my second to last lap, but catching me had knackered him and I easily dropped him by a couple of minuets once I upped the pace again. So it fell to me, with us in third by around 5-7 mins to complete the last lap. I was seriously worried I was going to let the team down, I thought the guy chasing me was a chap I knew, and he is normally faster and I only had a small lead. I really tried, thinking of all the extra sponsor money I was going to get for getting a top three, pushing my knackered legs as hard as I could up hill and really hammering the downhills, taking a many ‘safe’ risks as possible to gain time. Near the end of the lap, through the bombholes and through the throng of spectators I could hear the team shouting at me – hollering at me to grind out the last hill. Topping out the final hill was bliss, I knew I wasn’t going to be beaten downhill to the line, I’d done it that lap and the team had done it to make it into third. I had the biggest grin at the end and the feeling was great, third felt like first, it really did. What we could have done with four of us. Next year – bring it on! Simon Burgess (SPORT): It had been raining hard, on and off, for a couple of days and I Knew that it would be muddy on the course, hence it came as no surprise when the course was very muddy. Tyre choice was going to be a deciding factor as was experience of riding in this kind of gloop. 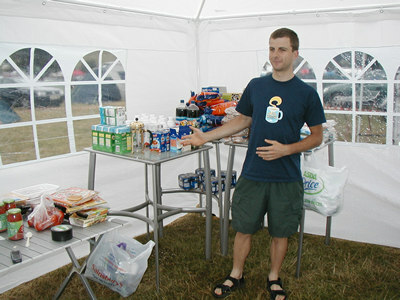 Help was on hand from the Torq team with plenty of food and bikes cleaned after every lap – this was such a help. You would not believe it unless you have done this kind of event before. Personally speaking my mud tyres were clogging up good and proper, but when the course dried up a bit & I switched to a drier weather tyre I put in some good fast laps, which I was happy with. The sport team was down to 3 riders so we had to do one more lap or so each, and I am still recovering from it all now. The SSMM is definitely not to be sniffed at, it was a real experience lapping with riders of all abilities on the course. If any roadies think they can just turn up to a XC event and ride away with a prize, then this is the kind of race where they will come totally unstuck! Bring it on for next year! 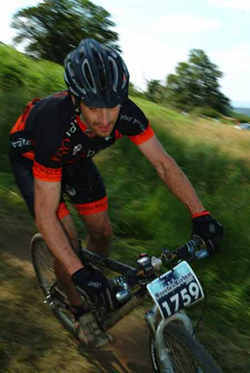 Steve Shaw (SPORT): Ive completed the Mountain Mayhem 5 times before, however this is the first time I’ve done it with the intention of racing for a podium finish. I couldn’t wait until the race started, I had the usual stomach butterflies one gets just before a race such as the NPS, which I found strange as the race was going to last 24hrs! I was nominated as the runner as I’m not too bad at running, so I made sure I was right at the front amongst the Elite riders. It seemed to take an age for the start, I think I was stood there for 10 minutes making conversation with others about what might happen during the race etc, then all of a sudden “bang” and we were off!! There was a lot of bustle and as usual it was the Clydesdale class riders throwing their weight about for the first 10m only to slow down and hold everyone up until the water splash. The run was about 1/2 a mile, maybe more, and I managed to be one of the front 10 to collect my bike – some people were already gasping for air. I completed my first lap very sketchily, lots of mud that made the tyres suddenly wash away on corners even with my Panaracer Fire Mud 1.8s. This I hadn’t anticipated and I could feel the strain of the bike slipping from underneath me pulling on my lower back and consequently, the 3 ribs that I had cracked two weeks earlier at the NPS when I landed on a competitor’s bike frame. First lap finished and we were in the top 20, some riders were just obviously riding too fast because the course was so gloopy and muddy, I had to rely on my RPE and estimate my power. I was near zone 5, so I backed off and dropped a few places. I handed over to Si T. and he put in a great lap, as did Si B. and Matt before handed back over to me. The course was now much stickier on the flat sections making it harder work, but it was also quicker downhill allowing some break-neck speeds to be achieved bearing in mind the mud tyres had no side tread! I was disappointed with my time when I got back, I hadn’t judged my pace quite right and came in the same time as my first lap – “gotta go faster in the woods and hold more speed” I told myself. The other 3 put in some quick laps, some 5mins quicker than me. 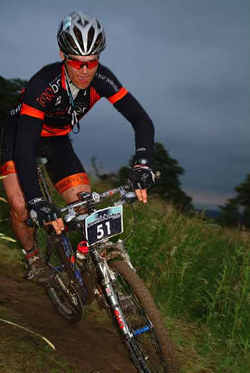 3rd lap was the dark lap, we were in 6th and I had the L&M Arc at the ready. Matt was running a little late as the Fireballs lost their power shortly after the bombhole but he put in a good time still. I decided I would make my night laps quick ones so that we could leap-frog the other teams by the morning and hopefully it would be too late for them to do anything about it. I was riding much quicker through the woods and despite a slip on the stupid wooden pallets was 5mins quicker at the 5mile point, I felt fantastic and was passing quite a few riders – although it was a little depressing have Oli Beckinsdale come past me up a steep muddy climb to the monument in at least 2 gears higher than I was pushing! I decided to try and follow him through the decent so that I could use some of his light to see where the bends were in the track – this was my overzealous mistake as there were a few little sharp climbs and one of them came off horribly wrong just before the 7 mile marker, I stood up to get more power down and something went shooting up my back – had I just been shot in the side with a crossbow?? No, but something was definitely wrong and the profanisaurus was required by other riders to understand what I was yelling about. Suddenly, I couldn’t sit down because of the bumps and couldn’t stand up either as it put too much stress on my core muscles and hurt my side. 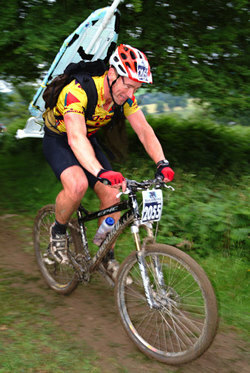 “the ribs” I thought, more profanities followed with nearly every pedal stroke and I was reduced to a near crawl. I ended up riding with one of the elite ladies who was giving me lots of good advice on how to get rid of my cramp.. “I don’t think its cramp miss” I said with tears pouring down my face. I limped home in a god-awful time, I’d suddenly lost nearly 15mins because of my snail-pace back to the start-finish. I remember Si Turners face at the handover point, “come on mate, you’re doing well” were his words, but his face looked worried. I got off the bike and “&*%$@@! !”, walking to the main tent was a mammoth effort – Pat Adams et el. looked at me like I was missing half my head when I asked for the 1st aid tent. When I got to the race doctor he had a quick look and had a feel, which basically relied on pressing my ribs until I said “ouch”. Game over said the doc, you shouldn’t be riding for 6-8weeks now. I hobbled back and spent the evening in absolute agony whenever I moved, or breathed. The other 3 managed to hang on from 1am until 2pm with some monumental efforts and Si Burgess putting in the superhuman fastest lap of the weekend at 55:16 to take us into 3rd place, only 8mins behind 2nd place. Less than 10mins separated 1st, 2nd and 3rd. The podium finish was great for the team, but I was mortified – 10mins, if only I hadn’t fallen the other week, still there’s always next year.. or SITS. Jeff and Jay Spetch (MECHANICS): SSMM, an amazing experience not to be missed by any committed MTBer, especially when you are part of one of the strongest up & coming teams in the UK . Fantastic results, and although our involvement this year as “Pit Crew Mechanics” Jay & I felt that our work on the Race Bikes was vitally important in helping to gain the fastest lap time’s possible on each & every circuit. 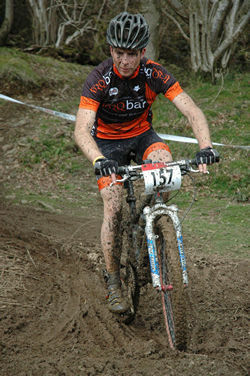 Proud to be involved with all of the TORQ Team family. JUST BRILLIANT! Blooming long article this eh? Takes 24 hours to read!! !